Fall accidents are less prevalent than slip and trip accidents, although they have a well-deserved reputation for being arguably the most dangerous of the three. Fall injuries are most commonly experienced as a result of doing a job which requires you to work in an elevated position and so it is no surprise that the construction and roofing industries are the primary contributors to the fall accident statistics. Falls themselves present the highest ratio of fatalities per accident. Common causes of falling include using the wrong access equipment for the task in hand, failure to use the prescribed safety equipment, adverse weather conditions, not having received adequate training and supervision, defective equipment or a disregard for proper safety measures while working at height. The Work at Height Regulations 2005 were introduced with the aim of reducing the number of accidents, injuries and fatalities involving falls and they outline the measures that employers, employees and self-employed people must adhered to. If you are asked or expected to perform a task in such a way as to contravene this legislation then your employer is placing you at risk and exposing themselves to legal action from the Health and Safety Executive as well as acting in a negligent fashion should any person be injured as a result of their operating practices. Contact someone nearby to obtain help. If you are, or believe that you are more seriously injured then ask that person to call for medical assistance – this could be anything from an on-site first aider, site manager, a safety officer or an ambulance – depending on severity. You may have been extremely lucky and suffered only minor bruising as you fell, but there is a serious risk of limb, spinal or head injuries with falls from height and so you should seek appropriate attention or seek out someone else to arrange this for you if you are unable to do so yourself. Record as much relevant information as you possibly can, including precisely where it took place and the circumstances leading up to the event itself. Ensure that the incident is recorded adequately in their Accident Book. Some accidents, depending on nature and/or severity must legally be reportable to the HSE or local authority under RIDDOR (Reporting of Injuries, Diseases and Dangerous Occurrences Regulations 1995) which assigns employers and premises operators a legal duty to do so. Witness statements and contact details. The account of independent witnesses can be of vital importance fall compensation claims and this cannot be overstated to prospective claimants. Detail and account for any loss or damage to your clothing and personal possessions if applicable. 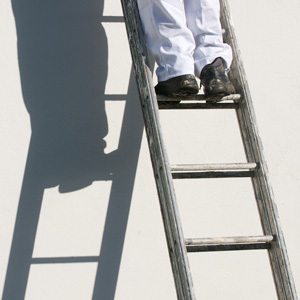 Ladders – falls from ladders are extremely common and can result from incorrect use of equipment (not using a suitable ladder for the job) or the ladder not being sited safely, or using ladders in poor weather conditions or with unsuitable footwear. Depending on the work height and the task being performed, injuries from falling from a ladder range all the way from a twisted ankle to death. Roofing – falls from the edges of a roof are highly likely to result in serious or fatal injuries and so guard-rails and toe-boards should always be in place, or work carried out using equipment such as a mobile access platform or cherry picker. Fragile Roofing – falls through skylights or through weathered sections of roofing that give way are almost certain to result in severe injury and/or death, particularly as they are most commonly used in commercial premises which have a considerably higher ceiling than an office environment for example. This section deals exclusively with falls from height. Slip fall accidents and trip fall accidents are dealt with under the respective sections – please see the site menu at the top of the page or the links in the sidebar to the right.